Thank you so much for the comment, you're so kind and I'm glad that you like my work !! HOT DAMN! The best Ranma fan art in the world! That mirror effect is just too cool! Nice, I love the reflection detail, smart! This is a truly fantastic work, I love how you've captured all the characters, and all the little details you've put in, like the reflections. Bravo! Definitely one of the best Ranma works I've seen in a long time. You've really captured the spirit of it. so awesome!!!! i love seeing fanart love for ranma!!! its absolutely one of my favorite manga series ever! 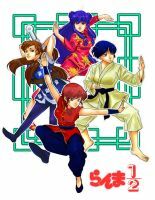 one of the best ranma fan arts I've seen in a long while! This is so sweet. Sell it as a poster or shirt print. That is quite a clever image. And Shampoo looks awesome. The lake reveals the truth. Wait... Are they at Jusenkyo? or maybe this is a collective dream, who knows?